Vanessa has been dancing since she could walk, and training in dance since age three. She has trained extensively in all styles of dance, and earned a B.A. in Dance and Certificate in Entrepreneurial Management from the University of Iowa in 2010. 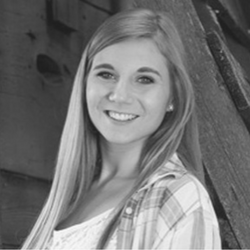 Vanessa has taught dance throughout Eastern Iowa – her teaching experience includes dance studios, pre-professional ballet classes, and non-profit after school and community programs. She directs the Company at The Pointe and teaches and choreographs for all ages and styles. Vanessa has won multiple Best Choreography and Judges Choice awards at dance competitions and has choreographed for school and community groups including show choirs, color guards, and theatre productions. Her goal is to share the physical, artistic, and emotional benefits of a quality dance education with as many students as she can. In 2016, Vanessa joined the Advisory Panel for Youth Protection Advocates in Dance, a non-profit organization dedicated to keeping dance a safe and healthy activity for children. In 2017, Vanessa launched The Pointe Foundation, a 501(c)3 nonprofit organization to raise funds and resources to provide scholarships for dance education and outreach opportunities to youth in the Cedar Rapids area. Vanessa is CPR, first aid, and YPAD Certified (January 2017). Josie grew up dancing in the Cedar Rapids area. She began choreographing in high school for her school’s varsity dance team and show choir. Josie earned a degree in Dance Performance and Choreography from Hope College. While pursuing her dance degree, Josie’s choreography was selected to be performed in formal concerts, and she also performed in student and faculty pieces. Josie interned with the Isadora Duncan foundation in New York City, teaching modern dance classes to children of all ages and studying at Steps on Broadway and Merce Cunningham Dance Company. In April 2017, Josie became YPAD Certified and in June of 2017 earned a teaching certification through Acrobatic Arts. Josie directs the modern program at The Pointe, and is a Company coach and choreographer. Josie supports all of her students and helps each one achieve their dance goals. Kara grew up dancing in western Iowa and began teaching while she was in high school. She earned a minor in dance at the University of Kansas. Kara has been a member of the studio staff since 2004, and has taught every age group from first graders to adults. Her favorite part of teaching is watching her students grow as dancers. She currently teaches tap and leaps and turns for levels 3-4, and is also one of the Company coaches. Kara especially enjoys teaching and choreographing tap! In addition to teaching classes, Kara also participates in the adult dance classes available at The Pointe. She loves the positive studio atmosphere and interacting with the students, their families, and her colleagues at The Pointe. Kara earned YPAD Certification in April 2017. Laura started dancing at the age of three in Crest Hill, IL at Times III Performing Arts Academy. She fell in love with all styles of dance including ballet, tap, jazz, lyrical, pointe, and hip hop, and was a teaching assistant. Laura then continued to Southeast Missouri State University where she graduated with her B.F.A. in Dance in May 2014. During her time at SMSU, she had the opportunity to perform many works by faulty, students, and guest choreographers in all styles. She had the privilege of performing ‘Psalm’ by Jose Limon at the American College Dance Festival Gala in 2013. Laura also had the opportunity to choreograph her own works for multiple concerts, and one of her pieces, ‘For Granted’, was chosen to be performed for adjudication at the American College Dance Festival. She has also studied with dance companies in the Chicago area through summer intensives and workshops including Joel Hall Dancers, Thodos Dance Chicago, and River North Dance Chicago. In April 2017, Laura earned YPAD Certification. In June 2017, Laura attended More Than Just Great Dancing’s Teacher Training program. Laura teaches all styles and levels, and is a Company coach. She is excited to continue teaching at The Pointe! Aaron got his start in the arts at an early age growing up in the thriving arts community that is Cedar Rapids, IA. He has extensive training in modern, ballet, jazz, and tap; as well as experience in hip-hop and ballroom. He also currently works as a freelance choreographer. Starting his studies in dance at a local studio, he continued his studies both at the University of Iowa and the University of Northern Iowa. He has been fortunate enough to take master classes with several accomplished choreographers, performers, professors, and grad-students throughout the Midwest. His work has been presented on the TCR stage, the UNI campus, and the surrounding area. He has had the privilege of having his compositional work presented and adjudicated at the American Collegiate Dance Association conference (North-Central Region) the past two years. Additionally, he was nominated for the Iowa Community Theatre Association Awards in Excellence for his choreography for Theatre Cedar Rapids’ production of “Mary Poppins”. Most recently he has choreographed TCR’s productions of “Grease” and “Billy Elliot”; and has been a part of their education staff for the past seven years. Outside of dance and theatre, he pursues a passionate career in massage therapy (see his massage therapy studio at massageloftcr.com ). Aaron is YPAD Certified. Cyndi grew up dancing in Omaha, Nebraska. As an adult, she has taken ballet, tap, jazz, and modern classes. She graduated from Iowa State University with an Early Childhood degree and earned her Masters Degree from the University of Iowa in the same field. Cyndi teaches preschool in the Linn-Mar school district and directs the Dance & Discover program at The Pointe. Cyndi teaches Mini Movers, Dance & Discover 1, 2, and 3, as well as Dance With Me! Preschool students love her fun class activities and friendly personality. Cyndi’s education in early childhood development ensures that all of the youngest students at The Pointe receive developmentally appropriate, technically sound, and safe dance training. Cyndi is YPAD Certified. Denise is a Cedar Rapids native, and grew up dancing in ballet, tap, and jazz classes. She also has experience performing and teaching ballroom and Latin! Denise works as a paraeducator for students with special needs through the Grant Wood AEA. Her compassionate and kind personality make her a wonderful teacher, and her students love her focus on technique and fun choreography. Denise is leading the new “A Chance To Dance” program at The Pointe – providing an opportunity for dance classes for students with special needs. Denise is committed to bringing the joy of dancing to all of her students, and earned YPAD Certification in April 2017. Savanah started dancing at the studio when she was three and continued until graduating from Linn-Mar high school. Throughout the years, she trained in all styles of dance – tap and lyrical were her favorites. Savanah was actively involved in competition teams for six years and has attended numerous competitions, master classes and conventions. She was a Teaching Assistant for several years working with dancers of all ages. She currently attends Kirkwood Community College, working towards a major in Pre-Pharmacy. Savanah is YPAD Certified (earned April 2017). Miss Savanah’s classes are fun and fresh, and her kind and nurturing demeanor make every student feel welcome. Beth grew up dancing and being very active in the performing arts in Omaha, Nebraska. She continued dancing in college at the University of Iowa while earning her degree in Communications. Beth also earned her Master’s Degree in Health Promotion and Certificate in Aging Studies at the U of I. She has been teaching dance since 1992, and both daughters danced competitively. Beth is experienced in tap, ballet, jazz, Pilates, and yoga. Her music background shows in her choreography. Her high-energy tap classes are fun and dynamic for all students! Beth earned YPAD Certification in April 2017.